All fabric for this quilt was made in a class with Linda Colsh several years ago. It wasn’t until I started using metal paints on fabric that I knew what to make. 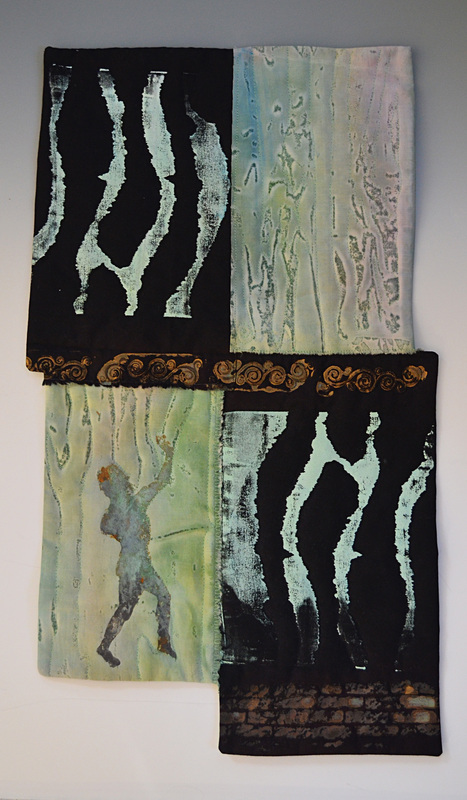 This one uses the energy in the green arches and the figure to evoke Vesuvius. The figure is transposed from a photo of the statue of Pan in Pompeii, painted with brass and iron paints, and patinating solution. ‘Pompeii,’ uses the same printed black fabric from Linda’s class. The leaves are metal paints printed with a stencil, both negative and positive versions. 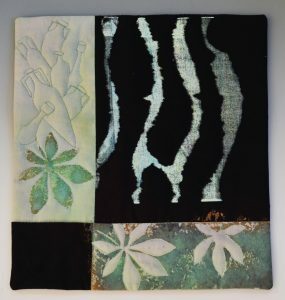 The wine bottles were drawn after a photo of wine bottles in the ruins, then machine quilted without any other enhancement on the hand-painted fabric.